Tasty, sub $25 wines with a distinctive character and made with quality, rather than pricepoint, firmly in sight. A good formula. I opened these alongside a few of Alex Head’s other 2014 releases and the ’14 Head Red GSM was voted crowd favourite. For sub $25 it’s an easy recommendation every which way. Sourced from a single 100 year old vineyard in Greenock in the celebrated western end of the Barossa Valley proper. It’s a part of the world known for colour and richness, if rarely delicacy. Purple wines ahoy. Dark ruby red, this smells of the Barossa, with lifted red cherry, plum and blueberry with a dash of vanilla oak. Dense, glycerol sweet palate of glacé plum and cosseting red fruit is nothing if not rich and delicious. And utterly Barossan. Lovely generous fruit sweet style, with warming length and so much ripe open easy fruit. A dip of spice and a lithe finish too. Real wine, real good. Feels very substantial for the price. Drink: 2015-2023. 17.7/20, 92/100. 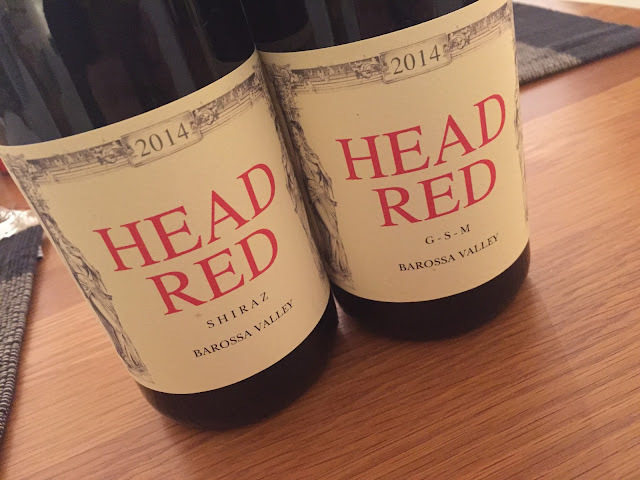 I’ve always thought of Alex ‘Heady’ Head as a Grenache maker first, Shiraz second. He won’t mind me saying that, surely. Anyway, this is a barrel cull from Alex’s other single vineyard Shiraz. According to him this is ‘the best value blend of Barossa Valley Shiraz I can make each year’.